But recent headlines have sparked debate about whether the benefits of spending billions of extra taxpayer dollars on security and surrendering basic liberties such as privacy, freedom of movement, freedom of association, the right to silence, the right against arbitrary detention, to name just a few, are justified by the terrorism threat. 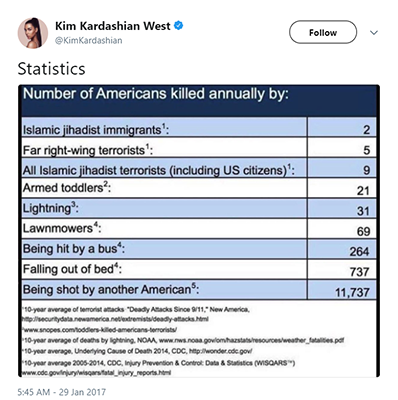 But recent statistics from the U.S. suggest that many seemingly “low risk” activities such as sleeping on a bed, taking a shower, and mowing the lawn pose a far greater risk to life and limb than terrorists. The statistics suggest that mowing the lawn killed an average of 76 people per year in the U.S. between 2004 and 2015, and falling out of bed killed an astounding 737 Americans per year during that period. A recent survey suggested that a whopping 43% of Americans are either “afraid” or “very afraid” of a terrorist attack. The Trump Government has budgeted $126.8 billion for the war on terror this financial year – expanding both the Navy and the Air Force and strengthening the Army and Marines as well as earmarking funds for cybersecurity. Spending was $80.3 billion during the previous financial year. In Australia, the federal and states governments have also beefed up counterterrorism spending. Federal defense spending is up six percent in 2017-18 to AU$34.6 billion, a figure that represents 1.9 percent of gross domestic product. The current Australian terrorism threat is set at “probable,” and an Australian National University poll recently reported that more than half of the nation’s adults are concerned Australia will be a target for terrorism at home. The same report found that most are convinced the government needs to introduce greater preventive measures to combat the threat. Last year, 1,225 people in Australia died in road fatalities and more than 3,000 people committed suicide in 2016. Around 400 women die each year in Australia as a result of domestic violence. These figures dwarf any threat posed by terrorism in Australia. Yet the government continues to make laws which remove their legal protections and safeguards and spend billions of extra dollars to guard against terrorism on their home soil.